When we first moved into our home six years ago, we started trying to tidy it up more or less straight away. It's a rented house, though when we moved in it wasn't particularly up to date...Everything was pretty worn, including the very outdated kitchen and carpets all through the house. Almost every room is covered in a type of bark looking fresco wallpaper and most of it was magnolia. 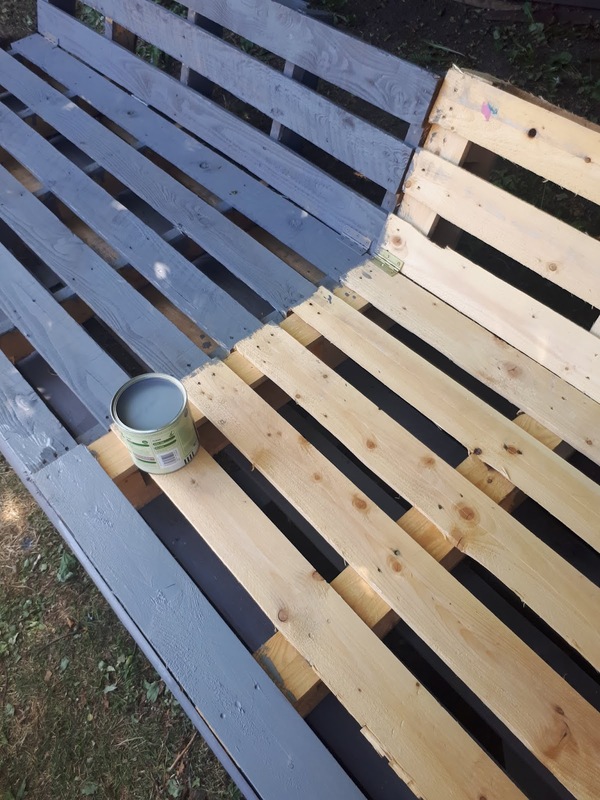 Over the years we've done what we can do-as we don't own the house- to brighten it up and make it ours, but it still needs work and isn't really how we would like it. 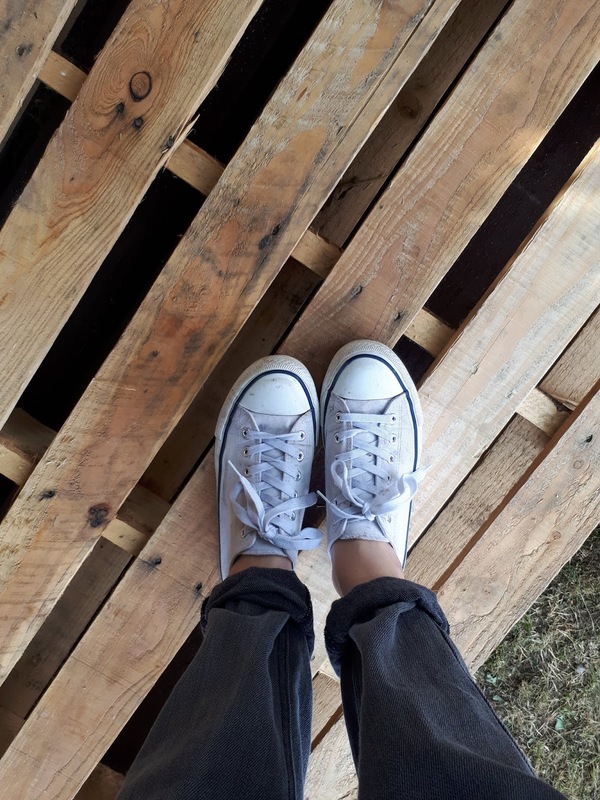 A splash of white paint has made it feel lighter and we've done jobs like stripping floors ourselves and cleaning carpets but we're in that middle place where our hands are tied; unless the owner chooses to update it we can't. Saying that I really do love this house, it's where we started out as parents, where all their childhood memories are; and although it's a bit like an old worn out winter coat it's still our cosy and safe place. Being at home more, I think the changes I'd like to make probably bother me the most, so I try to stay on top of things in the house and not over clutter. Having little ones, it's too easy to end up with too much of everything, especially when you consider all the Christmas and birthday gifts they get given and people's offerings of hand me down clothes, books, toys etc - which although are very appreciated can accumulate seriously fast! I am a bit militant when it comes to downsizing and I try to go though the kids things at least every couple of months (or less...) and give away things they don't wear or play with any more. I sometimes don't even know where it all comes from but you can guarantee I'll have several black bags full by the end. Personally I don't really collect anything and I'm not particularly sentimental unless it's things like photos or special gifts. I'm a huge fan of the charity shops simply because they're so cheap and when you've had enough of the clothes you can just re-donate them, so it's less waste! I think it's just down to personal character; I feel much better when there's less around me. 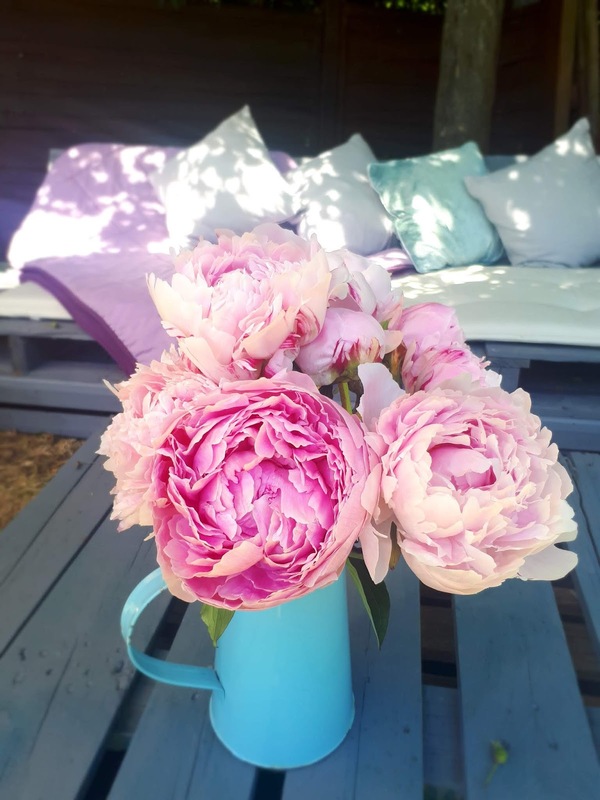 I can't concentrate in mess- probably why I get so little blogging done... Over the last couple of years I've really tried to clear the house of things we just don't need and I've found a big difference in the amount of tidying up I do. There's still the endless washing, dishes and general messiness that comes with living with three boys but because there are less things, there's less time spent tidying it up. I think it benefits children to have less as well; often I put toys away and they don't even remember they had them at all. I've had to get used to the fact that while I can't completely change our home I can create pretty areas here and there that keep me happy. A jug of fresh flowers and some new candles is often enough or even just having a few simple shelves with things I like on them. Last year I changed our dining room into more of a sitting room and added a comfy chair and new rug. 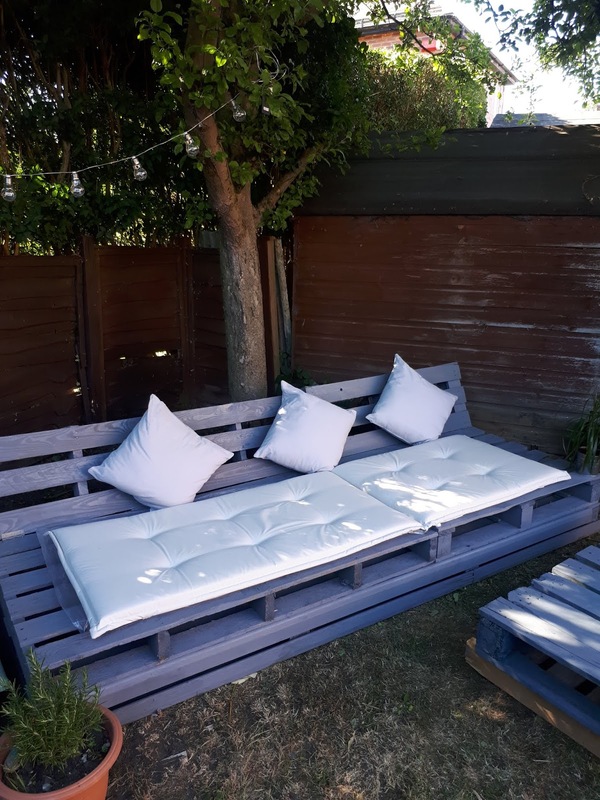 Its a nice place to sit and listen to music looking out into the garden or read while the kids play. When we moved here the garden was quite a state; really overgrown with a large compost/rubbish heap at the bottom of the garden. Joe helped a lot initially but since I love being out there it's been my work in progress for the last six years. I managed to level the compost heap, re paint all the fences and we've laid some new grass where it was patchy. There's still so much to do but it's looking better and most importantly we have a space where the kids can play. 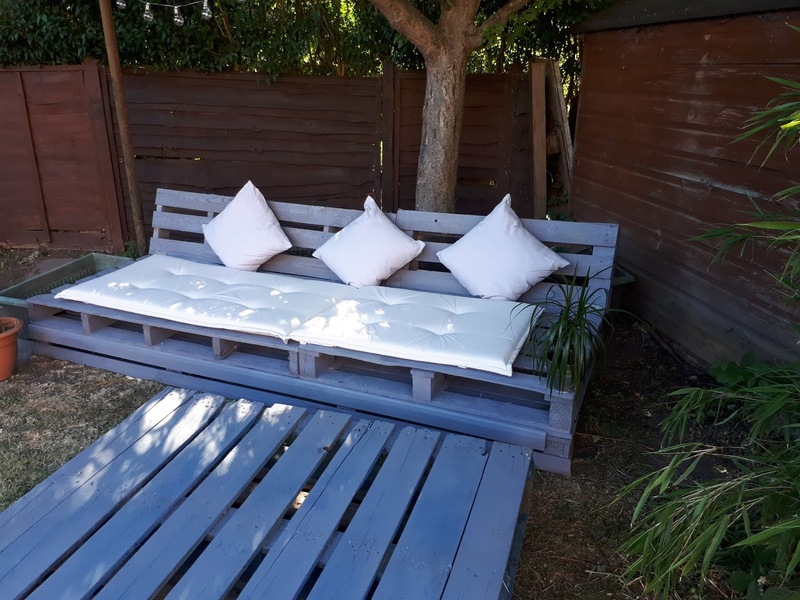 The weather has been amazing over the last month and I knew I really wanted to create somewhere to sit this year. The kids love being out in the paddling pool until late in the evening and I'm more than happy to make the most of the sun with them! 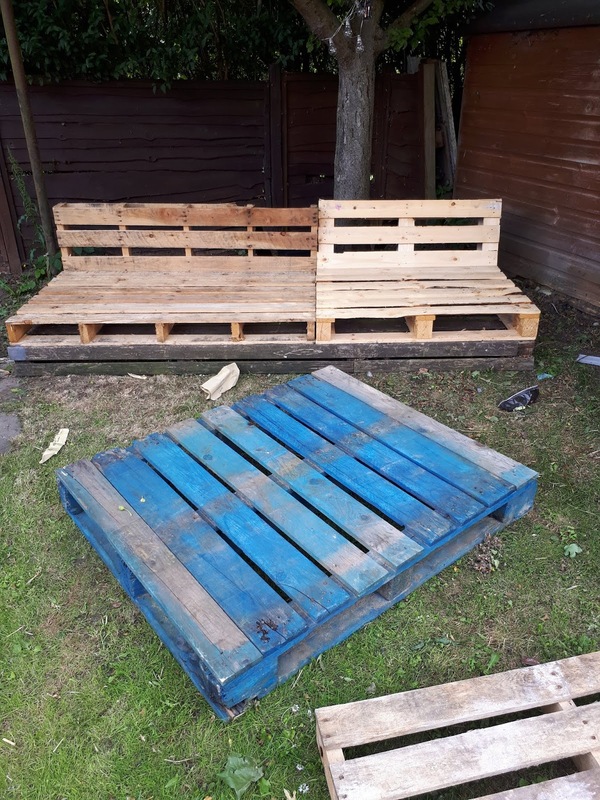 There are some gorgeous garden sets out at the moment but my budget was not going to stretch that far- I had a nosy on pinterest and then asked my dad to drop me round some wooden pallets which he has a lot of working in construction. Once I had laid them all out and worked out what I could create with them it really was just a case of stacking them and deciding on the seat depth. 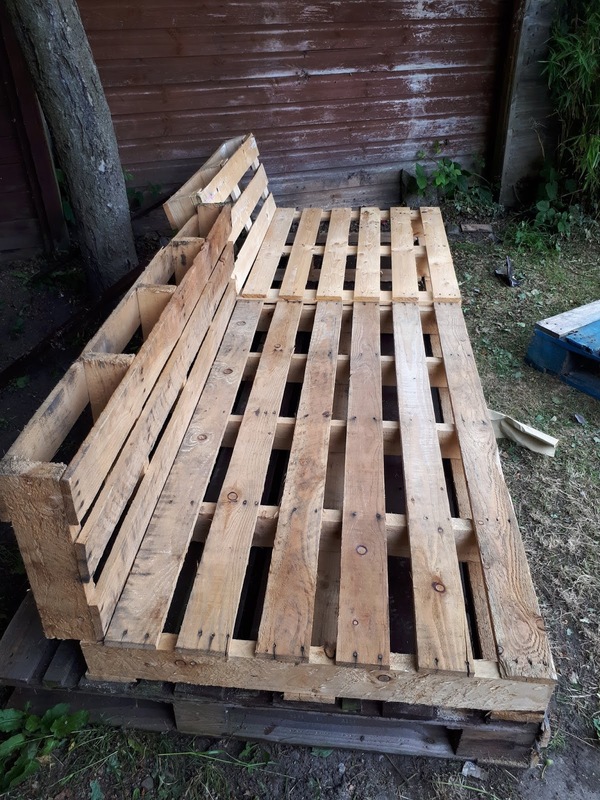 I wanted a lovely big sofa kind of seat that could fit a few people on; I used a normal hand saw to make a cut along the back of the pallets and then angled it to make the backrest. I picked up some brass hinges at Homebase and fixed them on to keep it in position- I know there are probably much better ways to do this but I'm not an expert and it worked! 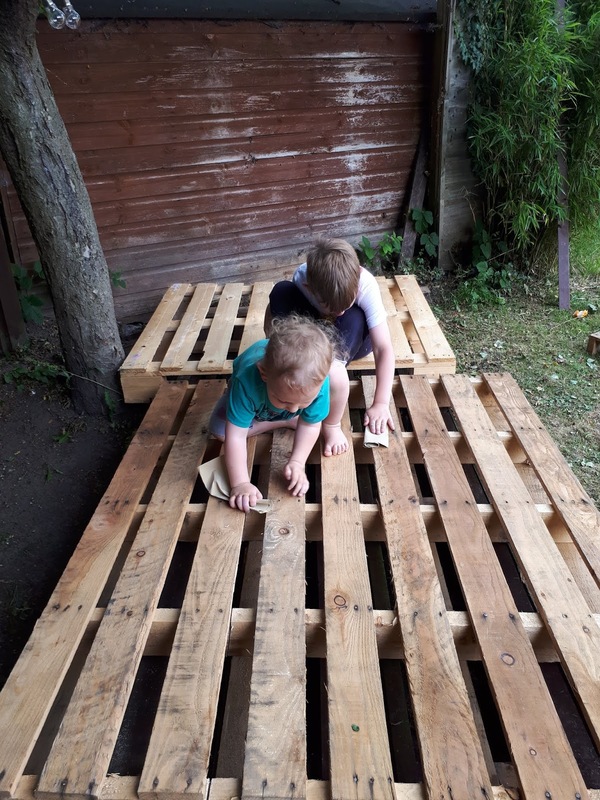 Sorry these photo's aren't great but I thought I'd show you the process- including my little helpers getting involved! After I'd done the assembly and fixing I gave it a lick of paint using some Cuprinol- I was going to choose a dark grey but went with Silver Birch in the end and I'm glad as it looks great- I thought it would only take one medium sized tin but I ended up using two once I'd painted the two pallets I'd used for a table. 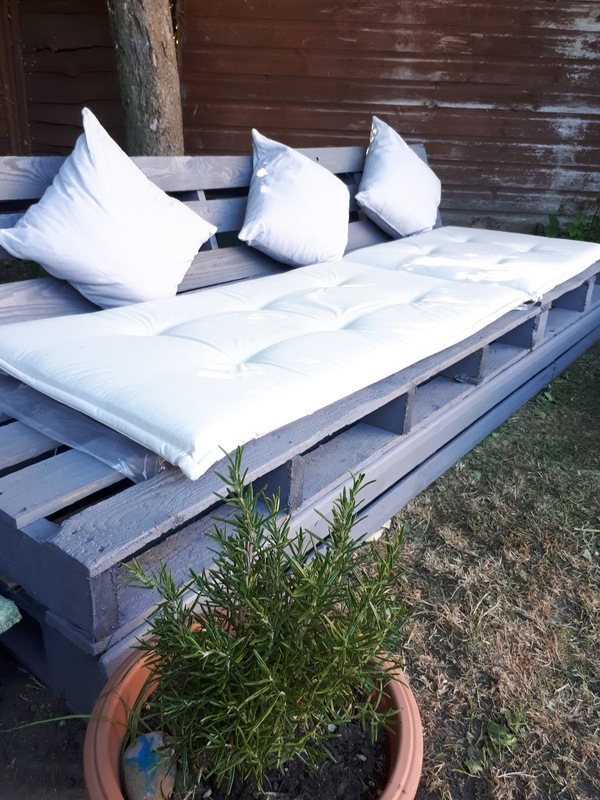 While I was at Homebase I saw some long sun-lounger cushions and thought they were just the right size and shape to add some extra comfort, I also picked up a few extra cushions for the back although there still isn't nearly enough! So there you have it, my little corner of the garden. 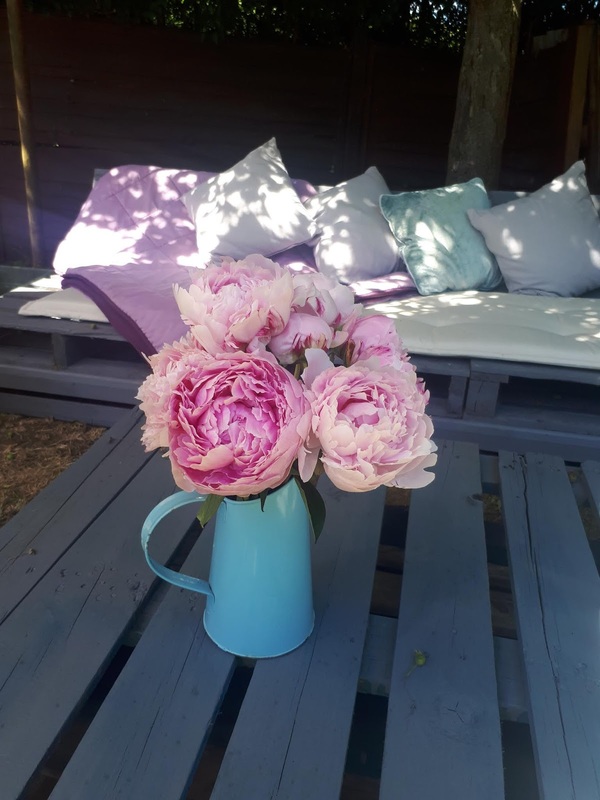 It's so nice to have a spot where we can relax and just enjoy the garden, we've even been having our breakfast and tea out here. Its something really simple that has made such a difference to our summer.